Pawn down and winning ? I've seen this a few times in various books, generally from Soviet sources, with the players given as Fuchter - Balogh or Fuster-Balogh, from Budapest, 1964. I've never found the full game, so don't know which of the many Baloghs it could be, or even if this is actually a study, rather than from an real game. Regardless, its a neat position. I've been in similar ones, but never quite the same. For me, its a sort of position that says "There are 3 rooks and a Queen together : so much power ! I must be able to do something good here" , but obvious moves don't seem to work. 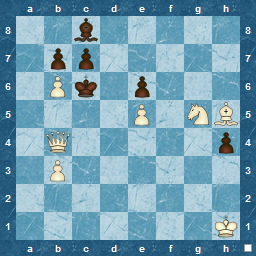 Black to move and win....what would you do ? I missed out on Round 1 because of incompatible times, so this was my first standard game in a while. I could give the excuse that I lost because I wasn't 100% fit ( echoing Zsusza Polgar's remark that she "never won a game against a healthy man" according to her sister, Judit's recent interview :) but that wouldn't be entirely true. I have to confess that recently ( er, read last couple of months ! ) I have not put much effort into keeping up the key part of chess improvement at my level ( ie tactics ), but there again I've done quite a few other things outside of chess in "real life". That means it's not just "work-home" balance to strive after, but "chess-others", or even more accurately chess as part of a range of things I want to do that are not work : sometimes that quite a few things ! So reasons to lose ? Plenty, and mainly around missing tactics. Reasons to win ? Not too many, and mainly around knowing the opening and resultant positions better than my opponent. Not really sure why Qf3 was played here. 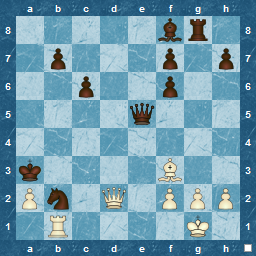 At the time, I assumed it was to allow prompt Queenside castling, with the added benefit of defending e4, but since he castled King-side later, I wonder ! Better would be Nf3 or even 0-0. 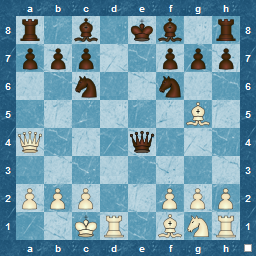 10. h3 What should Black play ? 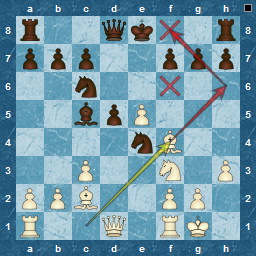 Considering my plan with Nc5 was targeting e4, how come I didn't follow through ? Much later in the game (move 40 ! ) I have a chance, not only to regain the pawn I am down, but also to strike a rapier-like psychological blow, just when White must feel he has me on the ropes. 40. Qd4 Black to play and at least equalise ! Its obvious in hindsight, but I missed it at the time. I'm sure all my avid readers will spot it in under 2 seconds and embarrass me ! Never mind. Make an effort to play through the game and see what can be learned. Next round, I will be more ready ! This caught me by surprise, but I dare say its a combination of her new book and her forthcoming appearance at the London Classic that has prompted it. An interview in the London Independent with Judit Polgár , who turns out to be a more than interesting person, as well as a great chess player. Enjoy it, I did ! T54, Round 1 : Centre and on target !! T54 began last week and I had the best start possible : a win ! How did I manage this considering I have done very little, chess-wise, in the past 6 weeks ? 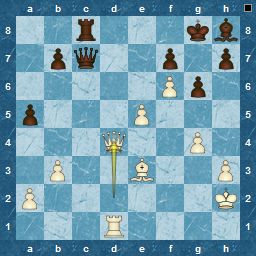 1) My opponent made two serious mistakes. 2) I spotted them and took advantage. 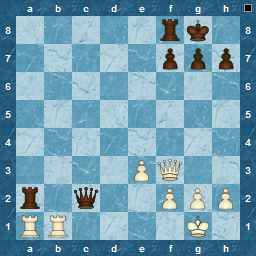 I'm pretty certain my opponent had done his homework since he knocked out his initial moves quickly. 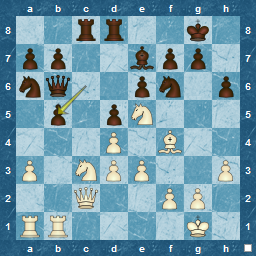 By the time we reached move 7, he was up to 50 minutes, compared to my 45, and I think he already had his initial plan in mind, which seemed to be a straightforward assault on the f2-square, intending, after my queenside castling , a knight-fork threat to win a rook. 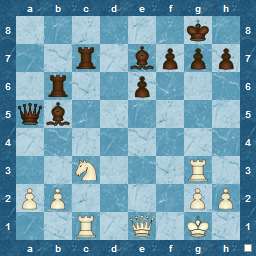 However, is Ng4 a good move here ? Andrew Paulson, who's he ? The next Team League season started last week and I didn't start that well ( again :). I can't complain about the ( minimal ) preparation and opening as I had exactly what I expected, trawling out my old Philidor against the expected e4. Overall, I certainly felt that I gained some sort of equality here on move 9. 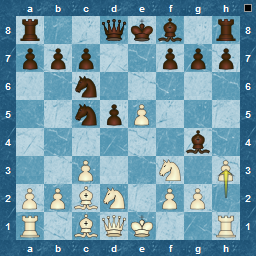 A decision to exchange, rather than retreat the Bishop, and my placement of the Knight on e4 ( which I thought was a great square, but my opponent described it as inconvenient, but not that intrusive ! ), left me a touch worse off. However, a disastrous mis-calculation after 12. Bf4 led me to play g5 ?? It seemed like a good move at the time ( although now it seems evident that 0-0 or Qe7 are better ) , I went through the possibilities of various exchanges and concluded that g4 was an OK move. But I didn't go the extra ply and, although I certainly did see Nxe4, I missed the very important fact that of the threatened Nf6 gave a very nasty check ! 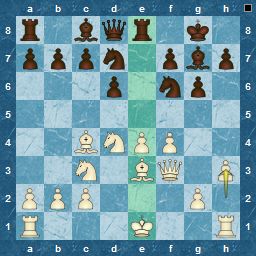 Of course, after the initial exchanges, I did see that I was really wrong, but elected for a defensive Qe7, rather than exchanging Queens, or even Be7 to defend f6. The latter moves may have left me down material, but certainly not dead and buried ! As you can guess, I collapsed very quickly as there was no decent defence. It is some vague form of comfort that Boris Gelfand also missed seeing the extra move(s) and lasted the same number of moves as me ( 17 ) against Anand before he resigned and left the World Championship equal again, and with very interesting times ahead in the next 4 games. 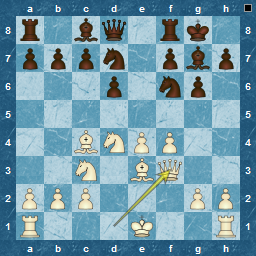 Not that I am in any way comparing games, but it is comforting to realise that even Grandmasters overlook moves. Nigel Short's recent good form has pushed his rating back above 2700 and put him (just) in the world's top 40 : not bad for an old geezer in this world of young chess players ! He also seems to enjoy his life as a chess player and seems willing to promote chess in unexpected countries according to this chessvibes article. 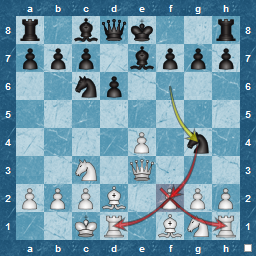 In his chess, he often plays some older openings and interesting sidelines.